I first discovered chestnuts as they were roasting in a British christmas market on a cold, snowy day. The warm bag of chestnuts went all over with me over the next hour; a comforting feeling as we walked across aisles of Christmas trinkets, games arena and a meeting with Santa. It occurred to me then how strange it was that we never ate chestnuts back in India. Didn't we have all the chestnuts trees up in the Himalayas. Back home, when Big Basket put chestnuts on their menu a couple of years back, I naturally assumed these were an imported variety. Turns out I was wrong. Chestnuts arrived early on Big Basket this year and they have clarified that these are the homegrown Himalayan chestnuts. The first time I bought them, I spent hours figuring out the right way to oven roast my stash. For this season's purchase though, I reckoned I will try a completely Indian manner of cooking and put them in a pressure cooker. Turns out it makes the chestnuts a pleasure to cook. Every time I fly Indigo Airlines, I make it a point to buy a tin of their smoked almonds. Salted, roasted and with an intense smoky flavour, these are some of the best almonds I've tasted. Now, it does seem kinda silly to pick which flight to book based on what snacks they sell onboard, so I felt this was high time I made my own smoked almonds. Smoking, if you haven't looked at it before, is a cool way to add charred flavour to everything from tea to meats. You do it by exposing food to smoke from burning wood, a technique favoured in most of US, Europe and Australia. India has its own smoking tradition - the whole school of dum cooking based on exposing food to smoke from red hot pieces of charcoal. Garam Masala is the cornerstone of Punjabi cooking. It's a mixed spice that gets tossed into every curry, every lentil dish, pretty much every thing we cook at home. My family even tosses some on top of a toast. Not surprising then, that every Punjabi household has their own garam masala recipe. I still use my mum's - not her recipe but the actual spice mix. I bring a batch back with me every time I go home to use until the next trip. Part of the reason I don't venture into making my own garam masala is because it was so hard to get my mum's recipe. But finally, after much guesswork and prodding to measure things just one time, we have the official Sareen family garam masala recipe. For the longest time, I debated on whether to share this recipe. After all, this is not your good looking Thai Red Curry or Green Curry. It's in fact, a very boring shade of brown. But then, this is brown for a reason. The red color in the traditional curry comes from a mix of dried red and fresh bird eye chillis. If you are a chilli wimp like me, the brown curry is the one for you. It's got all the flavour of the red curry but much, much less heat. This version's also adapted for my vegetarian tastes, and has no fish sauce or shrimp paste. So go ahead, make this piping hot bowl of comfort for a rainy day lunch. I've often wondered about the benefits of peeling teeny tiny potatoes to make dum aloo. Apart from the cuteness factor, there didn't seem to be much taste uptick versus a regular potato curry. Or so I thought. But then, a couple of weeks back, I went to this cooking competition where I was to cook a Bengali menu and got handed the recipe for aloor dum. Punchy and totally full of flavour, it's a dish I've been thinking of ever since. But I didn't bring back the recipe and I sort of forgot what all went in there so this is my own version. Think of it as the Punjabi curry counterpart of the aloor dum I made the other day. It's delicious nevertheless. MTR is now a well known brand around the country, known for their ready to cook and ready to eat packaged food and spices. But before it became MTR the brand, it was Mavalli Tiffin Room in Bangalore's Lalbagh. The first time I entered the rather shabby looking place, I was directed to the 'family room' on the first floor. And that's where I head each time now. You enter a waiting room on the first floor landing, obviously because the place draws hordes of people at dinner time. I beat the crowds by going there for tiffin or snacks between 3-5 pm. Even at that time, the place is busy but there is usually no waiting. There are no menus at MTR. There is a white board at the entrance that shows all that's available. Then you go into the dining hall which has pretty basic plastic chairs. They are all tables for four, so if it's only one or two of you, you are expected to share tables once it gets busy. Gluten free eating first started as a solution for those suffering from intolerance and allergies to gluten. But the last few years, it's become more mainstream with the 'health brigade' adopting it as their latest trend. I've personally stayed away from any gluten free baking so far, largely because I've no health reason to and I love plain flour based dishes way too much. But when a blogger friend asked if I would like to try baking with a new raw banana flour, it seemed like an intriguing flavour to try. Noticing how dark coloured the flour was, I knew anything vanilla based was out for this experiment. So I decided to bake my favourite chocolate chip cookie recipe, substituting the entire plain flour with recommended quantity of raw banana flour. I also added some coconut to up the flavour quotient, and out came the cookie that looked just like the original. A few months back, Rushina - who runs an awesome cooking studio and is a cookbook author herself - launched a cook book club. It's basically a book club for foodies. Every month, there is an event where Rushina invites a cookbook author, we chat and we cook some and then we eat all the awesome food from the author's book that Rushina's team made. Because the authors are obviously super knowledgable about whatever cuisine they wrote their book on, I always come back with nuggets of information and new techniques. Last month, we had India's favourite foodie, Kunal Vijaykar, come and chat about his book 'Made in India'. As Kunal made a chicken curry and a delicious fish dish, we got talking about the coconut based curries, which Kunal claims are the only real curries, as opposed to the tomato based gravies of North India. No matter whether you find themed menus cute or overly cheesy, you can't help but notice the creativity at Romano's. I first noticed the new Italian restaurant at JW Marriott Mumbai Sahar when social media posts appeared on their all black menu. A few weeks later, they came up with a new one called 'Paint me Love', just in time for Valentine's Day and which is how I found myself headed to try out this restaurant last evening. I find it really exciting to try and use different textures of one ingredient in a dish. Plus, we are just a day away from valentine's and everyone seems to looking for a bit of red in their life, so how about creating something fun and exciting out of beetroot. Let me talk you through the elements on this plate. I brushed beet hummus down the plate. On one side of the hummus border is a dab of yogurt with cooked beetroot slices. The other side has thin slivers of pickled beetroot interspersed with some more hung yogurt. And towards the edge you see beet leaves, filled with cottage cheese, rolled up and lightly sautéed in olive oil. India has this whole culture of chaat that is hard to explain to anyone outside. After all, chaat's not a meal in itself. It's not even a tea time dish or an appetizer. It just is a category of food by itself - eaten by the roadside, or at local restaurants, eaten when mood or opportunity strikes rather than at lunch or dinner. Chaat varies considerably across the country. In most of North India, crispy fried stuff is laced with spicy tamarind chutney and loads of yogurt. Fried potatoes count as chaat in Delhi, doused with tangy spices. But in Bombay, it changes its form again. There are still fried flour puris and papdis, but everything gets a generous sprinkle of fried gramflour vermicelli called sev and yogurt only makes an appearance in some specific varieties, not everything. Eight years ago on this day, I baked my first cookie, a chocolate spiral shortbread. I placed the plate of cookies on my sofa, clicked a shaky picture with my point and shoot Nikon and wrote about it on this newfangled thing called blogspot. 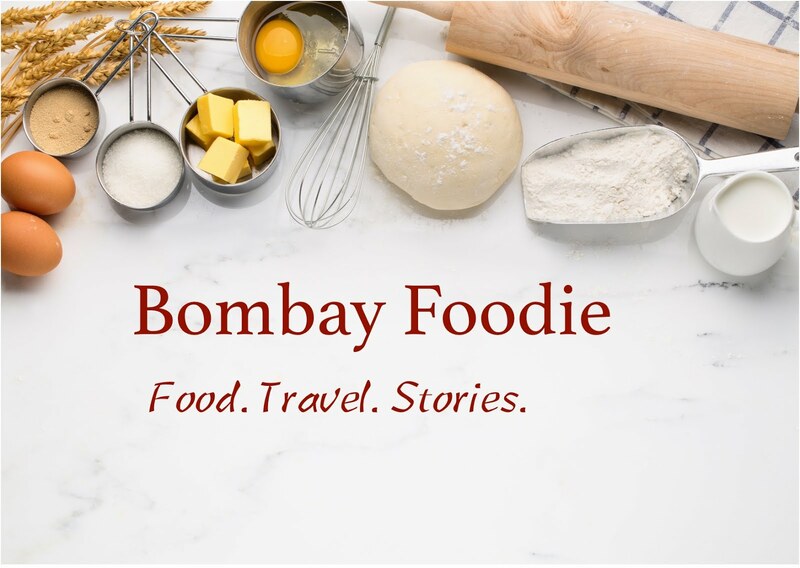 Bombay Foodie was born. To celebrate eight years of this delicious journey, I wanted to create a dish that I could not have made this time in 2008. Not only was this dish beyond my technical capabilities at the time, it was something I could not even have imagined. Naturally, I made s'mores pancakes. Every January, Mumbai hosts an exhibition called 'Mahalaxmi Saras' that brings together aritsans from around the country. The biggest draw at this exhibition are the farmers, producers and women from self help groups from remote parts of Mahrashtra. They come bearing homegrown cashews and kokum and lovingly made papads, chunteys and syrups. There is also a food court where stalls sell curries rarely seen outside rural homes, accompanied by wafer thin rice crepes or bhakris (the traditional millet flatbreads) made fresh over clay griddles. Between the packaged food sellers and the food court, Mahalaxmi Saras is a journey through rural Maharashtra. Every year, I come back surprised with how varied the local cuisine is and how much I am still to learn.